A city, from inside of a clearing. "From inside a clearing one hears noises, feels the presence of the trees, all the while being somehow in an intimate and inner space" this is how Stefano Boeri, founder of Stefano Boeri Architetti explains the inspiration behind Radura. Conceived and realized for the 2016 Milan Design Week, Radura appeared inside of the Cortile della Farmacia at Università degli Studi di Milano, a courtyard designed in the second half of the fifteenth century by Antonio di Pietro Averlino (better known as Il Filarete). The courtyard is a square space of about 30 meters on each side, surrounded by an arcaded loggia of columns and defined inside by a large lawn; this already quiet and self-contained space hosted what was the first prototype of a public space for urban decongestion, a small urban void that allows its visitors to rest and wait, to take a moment for themselves. This is Radura: a quiet, unexpected space inside of a intricate wood, where to breath and rest. In Milan Radura generated an intimate and collective space, where events of Design Week 2016, such as meetings, readings and concerts, were held. The abstracted and minimal form of the circular perimeter of Radura is a metaphor for a forest, symbolized and composed of 350 thin wood columns, with an external diameter of 10.5 m and an internal diameter of 7 m, an area equivalent to a common parking spot. The columns are fixed to the base of a circular wooden platform of 45 cm high, which can also be used as a seat in the inner part. The timber is extracted from forests in Friuli, a region located in Northern Italy, and is the result of a virtuous environmental policy based on forest management. "You enter through a threshold which is a light threshold and in another state of things, in another state of time, even in another state of the perception of colours", comments Stefano Boeri in the video shot by Blinkfish, wishing this structure to multiply and appear not only in Italy but also all over Europe and all over the world. And this is what actually happened: Radura was transferred to Udine, Piacenza, Sirmione and Amatrice to produce moments of gathering and meditation. All of these events are portrayed in the video, which also captures the process of the structure's construction, from the inspiration to the actual project. Together with Urban Hugs, a smaller installation sharing the same inspiration of Radura, Stefano Boeri Architetti managed to create a special shelter that protects citizens from the city, without secluding them. Sounds, colours and light filter through the forest of columns: this is a place to play, a place to sit, a place to think. 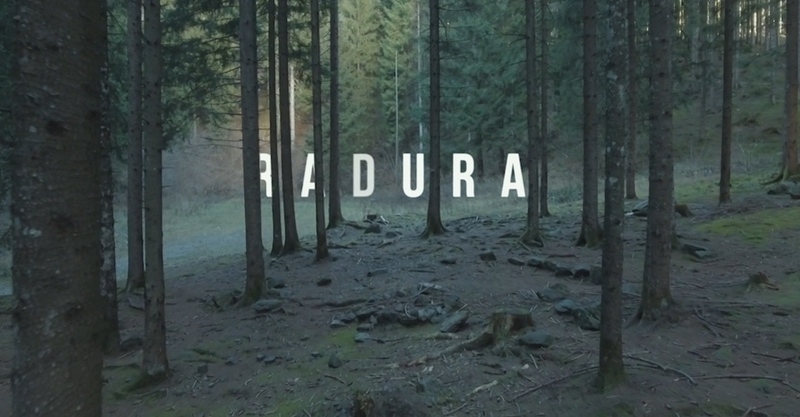 Sound design for Radura: Ferdinando Arnò per Quiet, please!